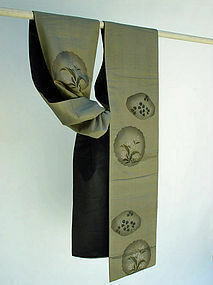 The front side of this obi is subtle but quite tasteful. As for the black side, it is ‘Nyogen’ silk fabric from China; there are two characters, ‘nyo gen’ and their distinctive red logo (plus other Chinese characters) woven at the end of the obi. Niogen silk was made in China and exported to Japan during the periods of Meiji to early Showa (19C to early 20C). They are top quality silk satins; lustrous, dense, thick but incredibly soft – it was woven with finer/thinner silk thread than of the Japanese. Trading between China and Japan was done throughout the Edo period on a non-official base. In early 17th century, the Japanese government (Tokugawa) banned Japanese merchants from trading outside of Japan to put a stop from the silver being depleted; later documents show that the silver had been continuously poured out of Japan from the trading ports in Kyushu southern island. Chinese merchants were freely coming to Hirado and later Nagasaki, I believe. Thank you “Kocho” san for sharing the information about Nyogen obi on your web site (Japanese). You have a wonderful homepage and super beautiful collection of Nyogen obi!